Boston, MA Related Beal broke ground on a new addition to the city’s expanding life sciences cluster in the Raymond L. Flynn Marine Park and named its first tenant. Mass Innovation Labs, a biotech research accelerator currently based in Kendall Sq., will take 54,000 s/f of space and anchor the first two floors of Related Beal’s new life science development, Innovation Sq. (iSQ) Seaport. iSQ, is a phased, 375,000 s/f, research and development life science campus. 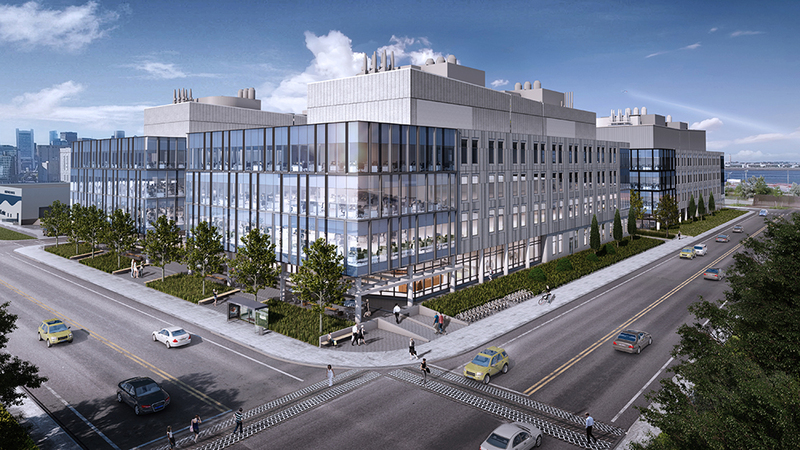 It is the first new construction, multi-tenant lab building in the Raymond L. Flynn Marine Park. Construction of Phase I, which consists of a four story, 125,000 s/f R&D building, is expected to be completed in Q1 2019. Related Beal, with its partner Kavanagh Advisory Group, executed the lease with Mass Innovation Labs, signed a long-term ground lease with the Boston Planning & Development Agency (BPDA), and closed construction loan financing for the development with East Boston Savings Bank. Founded in 2015, Mass Innovation Labs offers flexible lab space solutions to help life sciences companies at various stages reach their next milestones. The company’s success has continued to evolve in Kendall Sq. and the progression of customers such as Editas Medicine and CRISPR Therapeutics has fueled the need to expand to iSQ. Located at 6 Tide St., on the corner of Tide St. and Northern Ave., iSQ is designed to meet today’s flexible research and development requirements, including robust infrastructure and business amenities. The development will include a collaboration center, fitness center, interior bike storage, parking with electric vehicle charging stations, and green space. iSQ features an on-site MBTA Silver Line stop and is proximate to airport and major highways, including I-93 and the Mass Pike. Mass Innovation Labs was represented in the transaction by Ted Lyon of Cushman and Wakefield. JLL brokers Pete Bekarian, Don Domoretsky and Ben Hux represented Related Beal. Related Beal Construction and Consigli Construction Co. are the construction managers for iSQ. Related Beal has been a prominent developer of Greater Boston’s life sciences and biotech real estate business since the early 1980s, when it repositioned an assemblage of buildings in East Cambridge into Life Science Square, incubating dozens of startup biotech firms. Related Beal also became the first company to offer wet lab space for lease in the suburbs when it acquired Ledgemont Technology Center (LTC) in Lexington, MA in 1981. LTC consists of 185,000 s/f of newly renovated, first-class life sciences, office and technology space through interconnected buildings at 99 Hayden Ave. and 128 Spring St.. In 2000, Related Beal developed 300 Third St. in Kendall Sq., a 128,000 s/f, class-A lab property. Between 2006 and 2013, Related Beal owned and repositioned One Kendall Sq., a 667,000 s/f, mixed-use campus with lab, office and retail space. Related Beal is a fully integrated real estate firm focused on development opportunities in Boston and its surrounding areas. Related Beal leverages a national real estate platform with expertise across all asset classes and storied local experience in residential, commercial, hospitality and life sciences development, property management and investment. Related Beal has developed, and is undertaking the development of, some of the most recognized buildings in the area including The Clarendon, One Back Bay, The Beverly, the Quinzani Bakery site, Converse’s new world headquarters at Lovejoy Wharf and Congress Sq.